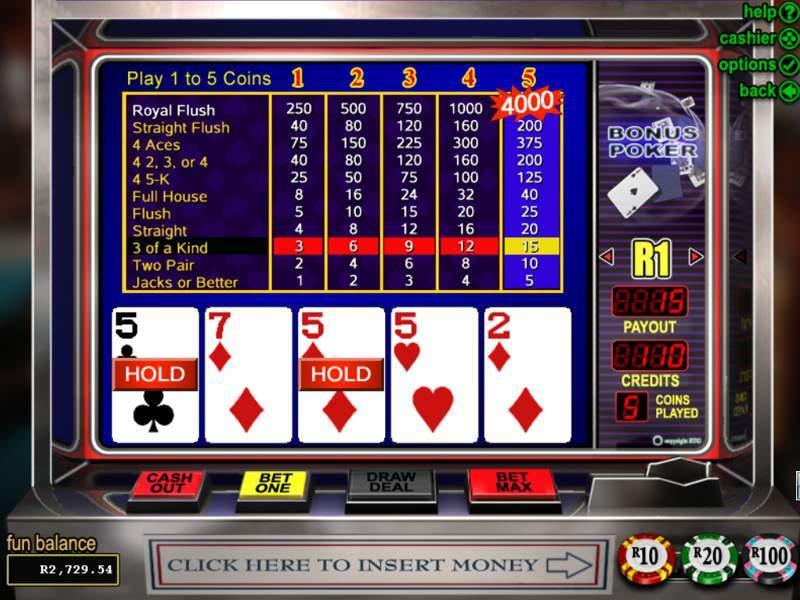 Video poker games come in a wide number of variations. Perhaps you’ve only heard about Jacks or Better, the most popular game, or only Deuces Wild, the second most popular game. But walk into a casino, and you’ll find a lot of other alternatives, including games that feature other wildcards and machines with large progressive jackpots. To help you get acquainted with these game variants, this page provides detailed information about the most popular variations, including a discussion of the most common pay tables and how to spot other versions. 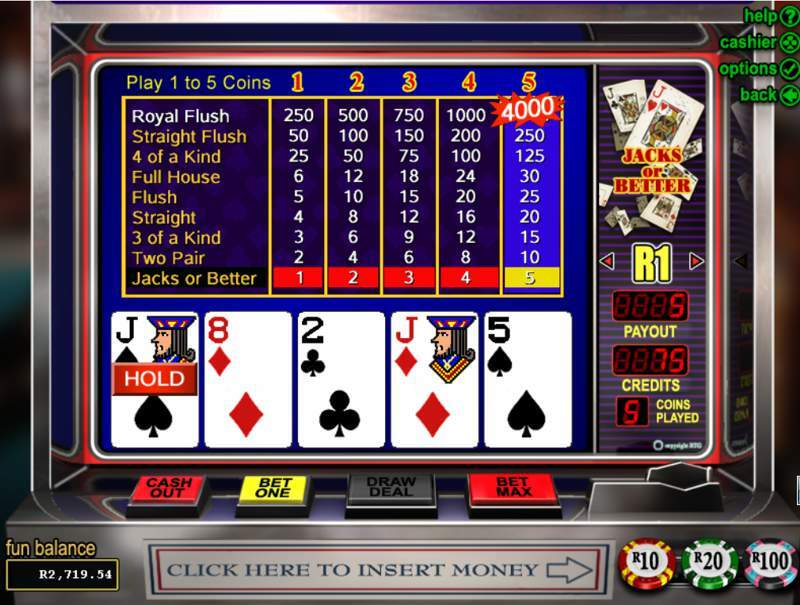 The page also includes a short description of the lesser known versions that you might find in casinos and gives reasons you might want to play these games, to help you narrow down the choices. It’s called “Jacks or Better” because that’s the lowest possible hand that wins you money. If you don’t get a pair, you lose. If you get any pair 10 or lower, you lose. And if you make a hand with excellent combinations like flushes, straights, and full houses, you win big payoffs. Of course, the royal flush gives you the jackpot. But let’s go back to talk about building a hand with a flush and the full house for a minute. The payout table on these two hands fluctuates a great deal from one machine to the next. You might think getting paid 8x or 9x on a full house isn’t going to make much of a difference, but playing on the one which pays out nine times what you wagered represents a significant increase in your odds if you play Jacks or Better a lot. The same can be said for the flush, which pays out less than the full house but happens more often. The two Jacks or Better machines you’ll see the most are the one which pays out 9x for a full house and 6x for a flush, along with the machine which pays out 8x for a full house and 5x for a flush. These games are called “9/6” and “8/5”. The difference in the house odds for these games is significant (over 2%), as the house advantage on 9/6 Jacks or Better is only 0.46%, and the house advantage on 8/5 Jacks or Better is up to 2.70%. It pays to find the full pay games in town. In the good old days, you could even find a 10/6 game, but that’s incredibly rare since optimal play on those machines meant professional gamblers would win more than they lost–a payout over 100%. You’ll occasionally find 7/5 or 6/5 pay tables, but don’t play those games. Unless you’re playing at a Native American casino where you won’t find another live casino for 500 miles, you can find a better version of the game. Never play a game with such lousy payouts when you’re online, and a better machine is a click away. 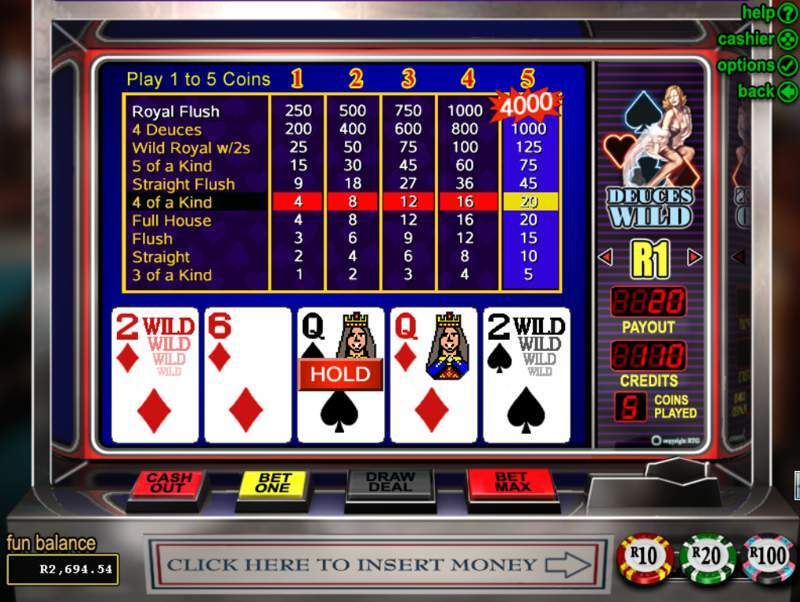 Deuces Wild is popular because it offers the two as a wild card and even offers slightly better odds than Jacks or Better. If you find the Not-So-Ugly Deuces Wild game (probably the best you can hope to find), it pays out at 99.73%, which is excellent. If you find the “full pay” Deuces Wild machine, it pays out a whopping 100.76% for perfect play. You can’t expect to find that version of Deuces Wild often, but understand that it’s out there and know how to spot it: 5x payouts on the four of a kind. Most Deuces Wild games offer a 4x payouts on the four of a kind. While 2s are wild cards in Deuces Wild, you have to fill out a minimum three of a kind to have a winning hand in this game. What the higher win hurdle and the wild card element does is make you think more about big hands, considering all the straights, flushes, and full houses that are possible. With the wild cards thrown into the mix, you’ll have to analyze more alternatives before making the correct call. Players can learn the perfect play, but it’s not always easy following the strategy when money is on the line, and lights are flashing in your face. Also known as “Joker Poker”, the Joker Wild is another popular variant you’re going to see sometimes in casinos. If you find the version where you win on “Kings or Better”, play this machine because it has payouts more than 100%. Usually, that won’t be the case. “Bonus Poker” games are almost the same as standard Jacks or Better except you have different payouts depending on the type of four of a kind you get. When you get a 4-of-a-kind with 5s through Kings, you get the lowest payout. When you get a 4-of-a-kind on deuces, threes, or fours, you get even more. A four of a kind with aces pays out the most. This game forces players to bust more often, since they are likely to keep a lot more 2s, 3s, and 4s in their original hand. But when you hit four of a kind, you get a major payoff. If you find a machine called “Double Bonus”, this game pays more for two pairs. In this game, you get to choose which card is wild. That might sound like a great opportunity, but the question which begs to be answered is which number pays out more when you pick it. The answer is “2”, while the “10” as a wildcard pays out less. Anything between 3 and 9 pays out a lower percentage, while the face cards pay out more than all number cards except 2. But the fact is, Anything’s Wild offers a bit of a false choice, because if you choose anything other than “2”, you aren’t making the right call. That makes this game comparable to Deuces Wild. 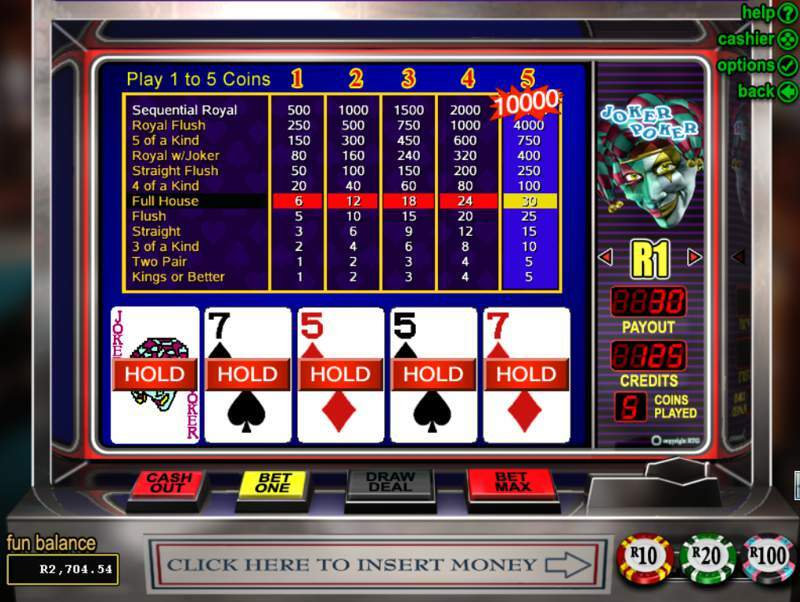 Other games you should try to play include Deuces and Joker Wild, Acey Deucey, All American, Double Pay, and Pickem Poker. Take them each in their turn. Try to learn each as a separate game and learn to master the strategies of each. But over a lifetime of playing, you should experience each of these at least once.